MeetSocks make OEM socks, and we receive designs directly from our clients. However, sometimes the designs are not easy to read thus lead to misunderstandings and wasted time and work. 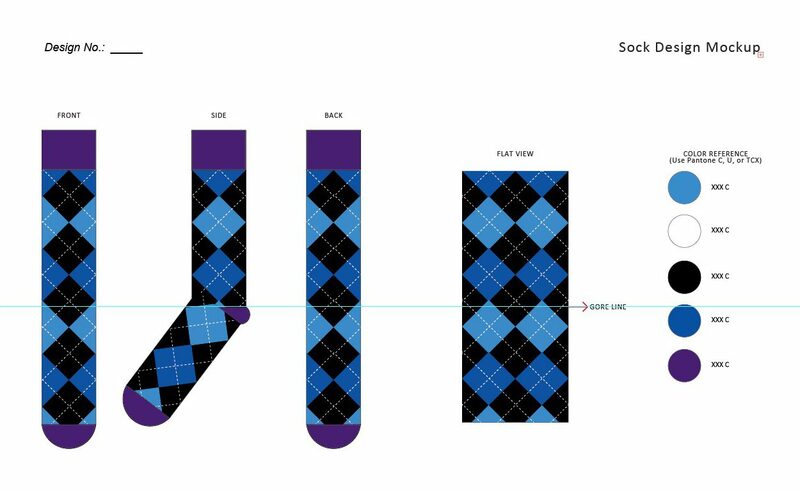 Recently we have been asked many times for a custom sock design template, and finally, we got our whole Custom Socks Design Template Kit done, we hope it will save our clients a lot of time and effort, especially for newly start-ups, and of course, you are always free to use your original templates. –You can download the custom sock design kit at the bottom of this page. | Acknowledgement: Some of the templates are revised from files provided by SockClub. 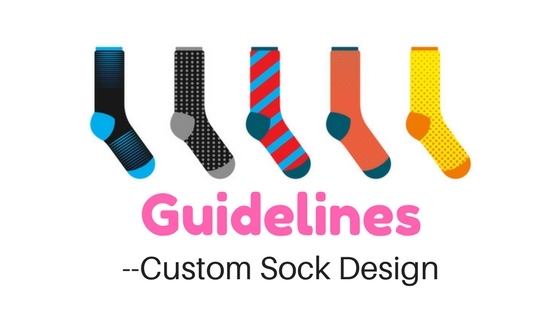 This is actually a shortcut and redirects to our post on the guidelines of custom sock design, make sure you follow the suggestions before you work on your custom sock design. The flat design is the first thing that you want to put your hands on. 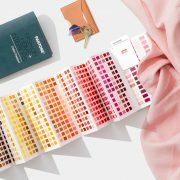 Create your unique patterns here and then move on to the mockup template. You will find the mockup has automatically updated according to your flat design pattern. Instead of using tags to private label your socks, you can choose to use custom bands. *We don’t need the band design at sampling stage, either. We just need it before bulk production. 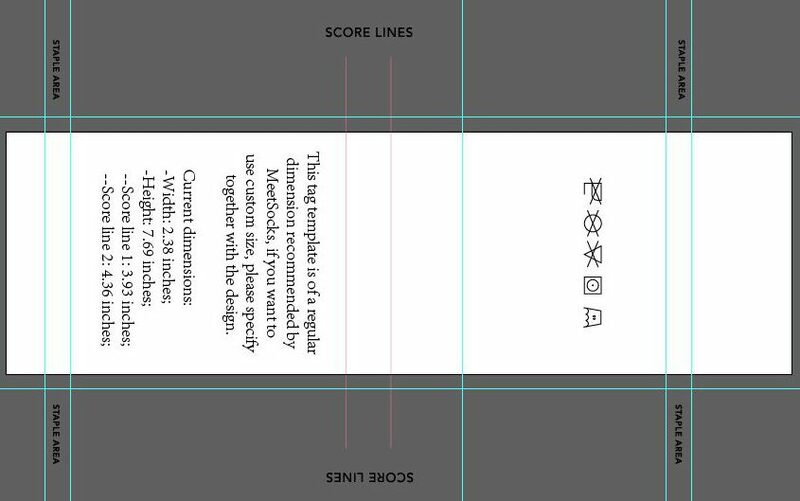 The custom socks tag template is rotated to be horizontal here and in Adobe Illustrator you will find it vertically aligned. Note that the front and back of the tag are of different dimensions to create a nicer view effect, and of course you can make them in the same length. * If you haven’t decided on the tag design, it’s okay because in the sampling stage we don’t need it. Just show us the tag design before we move into bulk production. The order confirmation spreadsheet is important because it shows all the details of your order, such as ordering quantity, yarn composition, sock size, shipping conditions, etc. 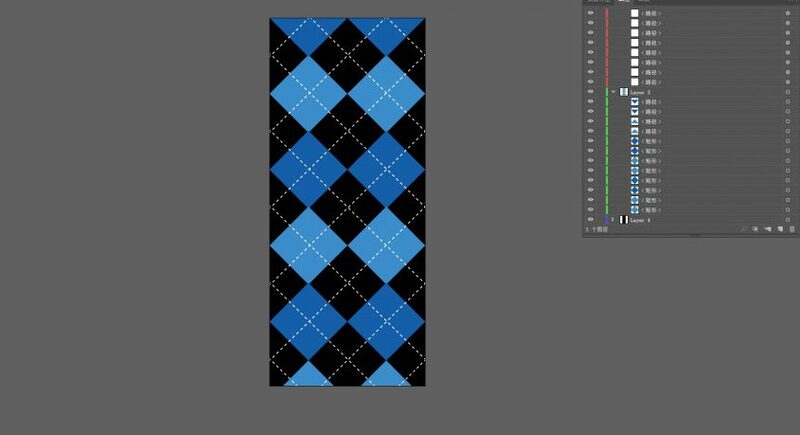 End: Download the custom sock design template kit! To avoid indiscriminately usage, subscribe to our subscription list and get the download link! If you would have any questions regarding custom socks manufacturing, leave a comment below and we will be very pleased to help! 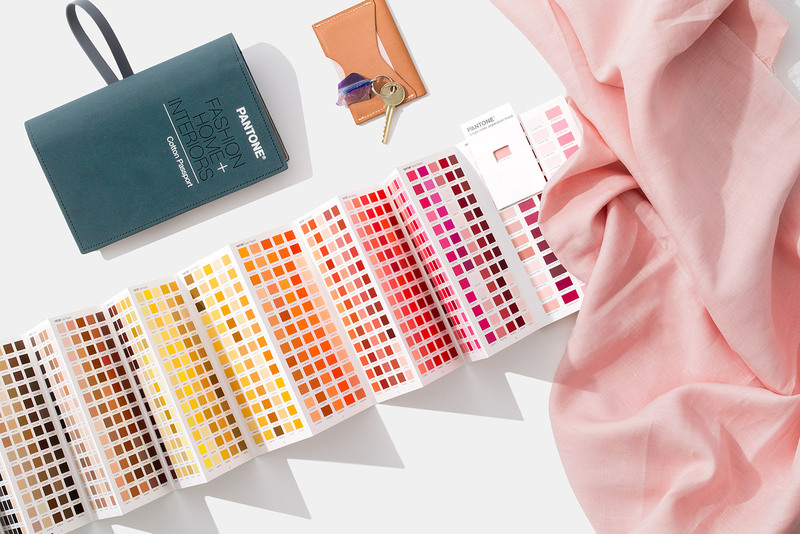 Wanted to know what type of Material for socks we can choose from. You can actually choose whatever material you like. We are nearer the biggest yarn distribution zone in the world, typically we can get whatever yarn. The premise is that you have a big order of socks to produce. Yes exactly, please write to us with the urls of the socks you want to private label. Hi,good morning from USA,can you pleade let me know what is your minimum for a small order?..thank you!! Do you have any designs related to the sport of bowling? Sorry, currently there isn’t any designs about bowling. I am a designer and I am interested in working with you. Feel free to contact me: imandelicdesign@gmail.com. Hi its been two weeks I am trying to contact your sales team but no luck. Can you please let me know what’s your minimum order ? Price ? And shipping to south korea? We do ship to South Korea and our MOQ is 1000 pairs per design. Greetings from uganda. how much dollars will it cost me to purchase a stock of 2,000 pairs of sport socks and to transport upto here? I have downloaded the design kit but can not access it or get it to work. How do i fix this. Hi Liam, the template is in .AI format, you need Adobe Illstrator to work with it. ‘Having trouble downloading the design and label templates. Please send them to me. My email is Dezygnher@gmail.com. Just send you the link for the template, please check your inbox. Hey, does you company work with athletic socks for soccer? I had a custom design i was working on and was curious if your company has the capability. Hi Yonathan, we can make athletic socks. Please write to sales@meetsocks.com with more details, thank you! What info should you put on the sock bands? Also thanks so much for all the info on this website. You have helped our sock business so much already! It feels great to be of help! is this company still in business? I have reached out to them several times but no response. Due to the unexpected business booming in custom socks, we are shorthanded here, to maintain service quality we have to say no to some of our customers. We are recruiting more people, but it takes quite amount of time for enough training and experience. Are you able to make compression socks? I would love to try this out, but the link is broken for Dropbox. Is there any way I can download another way? Hi Rachel, the link is still there, would you please check again? Hello, since I’m just starting out, I won’t be able to afford your minimum quantity. However, do you have any small manufacturer you could recommend that does small orders? It is not cheap on small quantity. I would recommend you do distribution first rather than making a new brand. Hello Ladies and Gentlemen, I read that the MOQ is 1000 pairs per design, however, what is the price per pair? Additionally I would like to ask you guys, whether my personal designs will be used by your firm as well (except the production on my request of course) or put online by you, or used in any other thinkable way? I would appreciate your answer, thank you for your time! No, we will keep your designs as business secret. I would like to know what will be the price per pair, for an order of 2000 pairs. High knee socks to be precise.Also what would be the cost of shipping to Greece.If you don’t want to answer this here please send me an email. Hi, is it possible to get sample socks shipped to Australia? Hi! I subscribed and I have received nothing at all! Any link for the free kit! Is it normal? Hi, subscribe again using the same email and the link will just show up above the box. I can’t download a can you please send me the link. How much dollars will it cost me to purchase a stock of 1,000 pairs of sport socks and to transport to Greenland and to Denmark? Can you give me the all quotation. Do you do custom lengths and sizes? Rejaul Hasnat Rubel on How to Start a Socks Business/Store? Lina on How to Start a Socks Business/Store? Kevin on How to Start a Socks Business/Store?